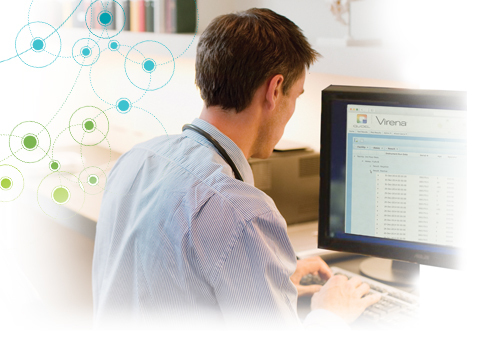 For customers who opted-in for use of the Virena system, please register at www.myvirena.com to utilize account specific data management services and near real-time mapping of disease incidence and prevalence. Virena provides an electronic data system for the near real-time result acquisition and exchange of disease surveillance information. When used in conjunction with Sofia, this automatic, labor-free transmission of de-identified data is a valuable adjunct to the objective, rapid diagnostic service enabled by Sofia Influenza A+B and RSV. Provides global wireless surveillance that works with Sofia to provide near real-time de-identified results in a secure and accessible database. Generates daily results automatically allowing for near real-time downloads without impacting workload requirements. Provides daily statistics that allow for a better indication of actual disease prevalence. Calculates percent positives for a given analyte (flu, RSV, etc. ), location or period of time. Visually maps disease progression through multiple views from a county, state or national perspective. Provides secured website access and downloadable CSV file format for state or national data analysis. Although demonstration shows Sofia results, Virena works the same for all Quidel instruments.